1 down 49 to go! 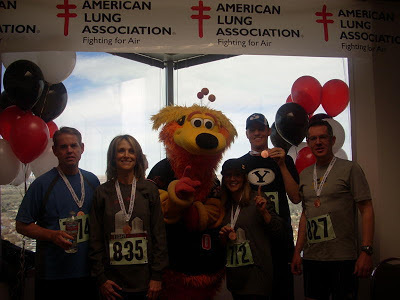 On February 26, 2011 I ran up the stairs of the tallest building in New Mexico, the Albuquerque Plaza in conjunction with the American Lung Associations Fight for Air Climb. 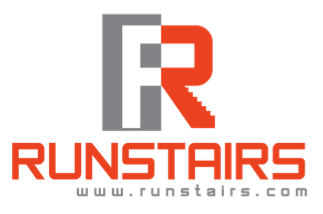 I had a hobby of running stairs while traveling and this was my first timed official stair run. I learned racing up a stairwell is different than working out in a stairwell. There was a 1 minute gap in between letting runners start the race. When it was my turn I started running as fast as I could zipping around the turns holding onto the handrail. After 5 floors it felt like I gained about 150 pounds and the my lungs were grasping for air like they never do when I workout at the gym or play basketball. After floor 7 I began to pass people. My pace had changed to stepping on almost every stair in a jogging speed rather than skipping a stair each step. There are 22 floors and once I hit the 14th floor I caught up to my boss from work who began the race a few spots ahead of me. I fell in behind him briskly walking as he went as fast as he could at this point in the race, he was 50 years old and I was 30. He told me to pass him, but I felt it would not be the right move to make (Can't pass your boss!!) and my lungs were pretty beat up so I decided to be lazy and follow him to the top. Despite my slower finish I still placed 14th overall with a 3 minute 49 second time. Albuquerque is a mile above sea level so running up even higher is killer on your lungs if you are not properly trained. My lungs were hurting for 10 days after the race which I thought was ironic considering it is the American Lung Association that puts on the race.